Love the floral fabrics. You yard is looking grand and ready for summer. I sure love all that fabric. I can’t wait to see what it turns into. Can’t wait to see what you are making!! I always love your goodies! Ooohhhh what are ya making over there? What are you making? I love the colors. oooh lovely! can’t wait to see what this becomes! 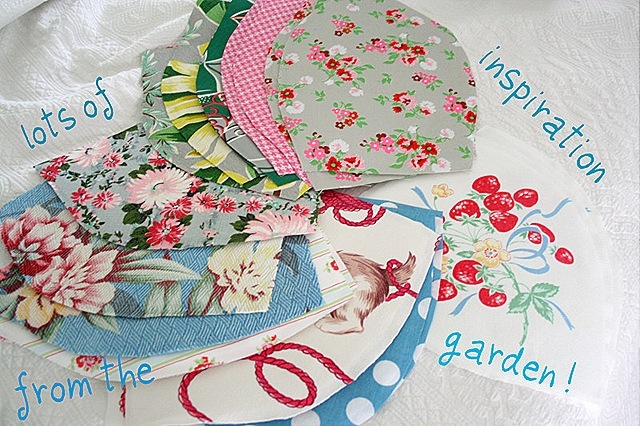 This time of year the dilema is whether to work in the garden with the flowers or the sewing room with the flowers. That doesn’t even include dishes with flowers. Frankly, my dear, I’m in love with your great vintage fabric pieces! They are all gorgeous!! !